Looking over my list of goals for 2015, I realize I should have specified that I mean to read more books this year. In 2011 and 2012, I read 30 books of various genres, but in 2014 — I’m embarrassed to say — I read less than one book per month. 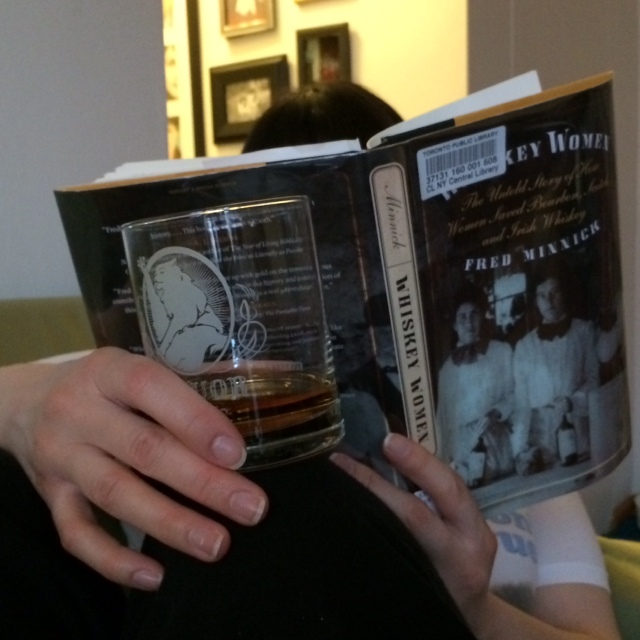 Coming as a surprise to no one but CBS News: women drink whisky and like it. Some even like it enough to found their own brands and tasting clubs. And to what, or rather to whom, do we attribute whisky’s apparently sudden popularity among women? The Washington Post, reporting on that CBS News report, asserts well-known female whisky drinkers, women like Hillary Clinton and Christina Hendricks, can take credit, but this is a little reductive. As Fred Minnick’s Whiskey Women shows, women have a long and colourful association with the spirit; it’s just that the association has now lost its stigma, which has allowed more women — unknown women like myself — to find their ways to whisky. Nor can we discount the influence of the overall resurgence of whisky’s popularity. But that’s just my two cents. The Whisky Advocate made its picks for the best expressions of 2014, and the best Canadian whisky is all rye: Canadian Club Chairman’s Select 100% Rye. It really is a wonderfully smooth, flavourful dram, and great value for money. On taste alone, I prefer it to the regular Canadian Club, which I’ve always imagined had more in common with paint thinner than whisky. This expression is great on its own, and divine in a Manhattan — and that’s coming from a bourbon Manhattan drinker! The only thing more quintessentially Scottish than peated whisky may be Harris tweed — until now. Harris Tweed Hebrides, Johnnie Walker Black, and Heriot-Watt University have come together with designer Angelos Bratis to craft tweed jackets that permanently smell like whisky. Possibly the perfect birthday gift for that whisky drinker in your life. Not sure about the whisky tweed? Here’s great advice about gifting bottles of whisky that has currency far beyond the Christmas season. Has someone bought you a bottle of whisky that you just don’t like? Don’t pour it out or regift the bottle yet! A better tasting dram may be only 24 hours away. This is an older link, but worth sharing. Note well: “10 whiskies you probably haven’t tried (but really should).” The recommendations come from Ian Buxton, whose 101 Legendary Whiskies You’re Dying to Try But (Possibly) Never Will I’m excited to read this year even though it may cause me to cry in my dram. This entry was posted in whisky and whiskey and tagged food and drink, Tasting Flight, whiskey, whisky. Bookmark the permalink. One book a month is still not too shabby. I know what you mean about the digital taking over, however. Though they’ll never beat the smell and feel of a book, the articles you list are certainly good value!